It is hard to say whether the decision announced Wednesday by Athanasios Hadjis, the quasi-judge of the Canadian “Human Rights” Tribunal, is a victory for free speech in Canada. He ruled that Marc Lemire, webmaster of Freedomsite.org, should not be punished for exercising his right to free speech, nor for allowing others who contributed unmoderated comments for exercising theirs. He found only one act of Lemire’s sufficiently bitter to constitute “hate speech” — namely his posting of an article entitled “AIDS Secrets” by an American neo-Nazi, that went on rather tendentiously about blacks and homosexuals. But he let that pass, too, on the interesting argument that Section 13(1) of the Canadian Human Rights Act is in conflict with our Charter of Rights, which unambiguously guarantees free speech. Either that, or his argument was that the CHRT has no right to punish anybody for anything: I have even more difficulty than other reviewers in making out the reasoning in this 107-page document. Hadjis is only a quasi-judge, and his decision can be appealed to a proper court. He had no authority to strike down Section 13(1), as he seems to realize, but by deciding the case as if he had this authority, he was being true to the traditions of the “human rights” bureaucracies, which live in a kind of statutory alternative universe, where logic no more exists than due process, and the law is what the bureaucrats say it is from day to day. But since the net effect was to release Lemire from six years of Kafkaesque investigation and persecution by the CHRC — and by Richard Warman, the lawyer who acted as complainant — I suppose I’m in favour of it. Moreover, it is the first Section 13 censorship case in the history of the tribunal in which the quasi-defendant has been quasi-let-off; as well as the first procedural setback for Warman, who has personally brought most of the previous cases and personally benefited from several of the judgements. 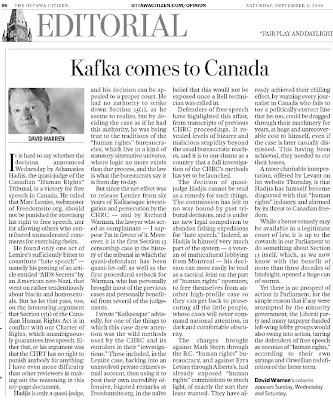 I wrote “Kafkaesque” advisedly, for one of the things to which this case drew attention was the wild methods used by the CHRC and its outriders in their “investigations.” These included, in the Lemire case, hacking into an uninvolved private citizen’s e-mail account, then using it to post their own incredibly offensive, bigoted remarks at Freedomsite.org, in the naïve belief that this would not be exposed once a Bell technician was called in. Defenders of free speech have highlighted this affair, from transcripts of previous CHRC proceedings. It revealed levels of bizarre and malicious stupidity beyond the usual bureaucratic reaches, and it is to our shame as a country that a full investigation of the CHRC’s methods has yet to be launched. The decision of quasi-judge Hadjis cannot be read as a remedy for such things. The commission has felt in no way bound by past tribunal decisions, and is under no new legal compulsion to abandon fishing expeditions for “hate speech.” Indeed, as Hadjis is himself very much part of the system — a veteran of multicultural lobbying from Montreal — his decision can more easily be read as a tactical feint on the part of “human rights” operators, to free themselves from another high-profile case so they can get back to prosecuting all the little people, whose cases will never command national attention, in dark and comfortable obscurity. The charges brought against Mark Steyn through the B.C. “human rights” bureaucracy, and against Ezra Levant through Alberta’s, had already exposed “human rights” commissions to much light, of exactly the sort they least wanted. They have already achieved their chilling effect, by warning every journalist in Canada who fails to toe a politically-correct line that he, too, could be dragged through their machinery for years, at huge and unrecoverable cost to himself, even if the case is later casually dismissed. This having been achieved, they needed to cut their losses. A more charitable interpretation, offered by Levant on his website Thursday, is that Hadjis has himself become disgusted with that “human rights” industry, and alarmed by its threat to Canadian freedom. While a better remedy may be available in a legitimate court of law, it is up to the cowards in our Parliament to do something about Section 13 itself, which, as we now know with the benefit of more than three decades of hindsight, opened a huge can of worms. Yet there is no prospect of action in Parliament, for the simple reason that if any were attempted by the minority government, the Liberal party and many taxpayer-funded left-wing lobby groups would also swing into action, tarring the defenders of free speech as enemies of “human rights,” according to their own strange and Orwellian redefinition of the latter term. David Warren’s column appears Sunday, Wednesday and Saturday.